Milestones | Our Company | INABATA & CO., LTD.
Katsutaro Inabata established Muslin Boshoku with other founding members in Osaka to begin domestic production of muslin, a thin and light yet warm wool fabric which at the time was being purchased in large quantities for use in women’s kimonos. The following year, in 1896, Katsutaro Inabata set off for France on his own initiative to research spinning and weaving technology and purchase machinery and equipment. In France, he managed to acquire Muslin production methods before returning to Japan and considered the spinning and weaving machines manufactured by Société Alsacienne de Constructions Mécaniques in France to be the best, which led to business between the two companies. Inabata Shoten presents Japan's first cinema shows – For a period of one week beginning on February 15, 1897, Inabata Shoten presented Japan's first cinema shows at the Nanchi Enbujo Theater, located in the Namba district of Osaka, using the cinematograph. A newspaper at the time wrote, "The audience was surprised and amazed by the moving picture." 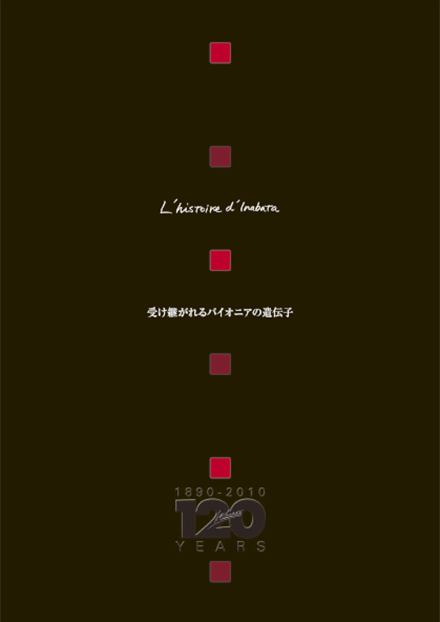 While in France, Katsutaro Inabata attended school together with elder of the Lumiere brothers, the inventors of the cinematograph. Katsutaro met him again while on business in France for Muslin Boshoku Seeing the cinematograph for the first time, Katsutaro decided to bring the invention back to Japan to introduce advances in Western culture to the country. Inabata Dye House – Inabata Dye House was established in Osaka in May of 1897 to launch a dye processing business using state-of-the-art techniques. The maroon color developed by Inabata Dye House was called Inabata-zome and was widely used for girls' school uniforms and "hakama"- style skirts for women from the middle of the Meiji period. In addition, an original khaki color was adopted by the Japanese military forces for camouflage uniforms on the battlefield. Katsutaro Inabata assumes the presidency of The Japan Dyestuff Manufacturing Co., Ltd. The Japan Dyestuff Manufacturing Co., Ltd. – In 1916, The Japan Dyestuff Manufacturing Co., Ltd. (Nippon Senryo Seizo company) was established with the aim of encouraging the domestic production of synthetic dyes since Japan relied heavily on imports of the product at the time. Katsutaro Inabata was involved in the establishment of this company, becoming the firm's auditor and then president. The company would later be privatized, and, through aggressive management, contributed to the proliferation of domestic dyes. In addition, the company expanded operations to include chemicals and pharmaceuticals. However, as a result of national policies related to World War II, Japan Dyestuff merged with Sumitomo Chemical Co., Ltd. in July of 1944. Even after the merger, all special business agreements with Inabata remained unchanged. As a result, Inabata became the specified agent of Sumitomo Chemical for products produced by Japan Dyestuff prior to the merger. This marked the beginning of the close relationship between Sumitomo Chemical and Inabata. Ownership of Inabata Dye House transferred to Toyobo Co., Ltd.
"Inabata Sangyo" becomes the Japanese company name. Nippon Senryo merges into Sumitomo Chemical Co., Ltd.
Inabata & Co., Ltd. becomes the exclusive distributor of dyestuffs, chemicals, and pharmaceuticals for Sumitomo Chemical Co., Ltd.
Demand for polypropylene—a visit to Montecatini – Industrialization of polypropylene, an all-purpose resin similar to wool and looked to as the ultimate fiber, began in 1957 by the Italian firm Montecatini (later Montedison), located in Milan. Having quickly learned of this, President Taro Inabata and Managing Executive Officer Susumu Ogawa visited Montecatini in 1957, which led to the conclusion of a provisional import contract. Polypropylene was imported into Japan by Inabata for the first time in 1959. Stock listed on Second Section of the Tokyo Stock Exchange. Resin compound manufacturer Sanyo-IK Color (Pte.) Ltd. is established in Singapore as a joint venture by Inabata and Sanyo Kako Co. Ltd.
Pharmaceuticals Division separated, Sumitomo Pharmaceuticals Co., Ltd. (now Dainippon Sumitomo Pharma Co., Ltd.) established as a joint venture with Sumitomo Chemical Co., Ltd.
Inabata plays a central role in promoting construction project and fund raising for the construction of Villa Kujoyama, a facility designed to promote French-Japanese exchange in Kyoto (completed November 1992) as an anniversary commemoration activity. Company founder Katsutaro Inabata studied about the dyeing industry in Lyon, France, as a student under a program sponsored by the Kyoto Prefectural Government. After he spent eight years in France studying dyeing techniques, Inabata continued a long relationship with the country. Sociedade Luso-Niponica de Osaka – 1993 marked 450 years of friendship between Japan and Portugal since the introduction of guns to Japan in 1543. This anniversary served as a step in the establishment of Sociedade Luso-Niponica de Osaka by Katsuo Inabata, Osaka's honorary consul to Portugal, on November 14, 1994 in an effort to promote international exchange between the two countries. Dye and dyeing auxiliaries technology information and analysis data provider Shanghai Scheco-Inabata Dyestuff Research&Application Center Co., Ltd.
General stationery manufacturer KOKUYO-IK (Thailand) Co., Ltd. established in Samutprakarn together with KOKUYO Co., Ltd.
Inabata acquires the rights for the manufacture and sale of LED encapsulant from Henkel Japan Ltd.
Pharmasynthese S.A.S. established after acquiring Ardea Group, which was a manufacturer of fine chemicals in France. Dye business transferred to the newly established Inabata Fine Tech & Co., Ltd.